Despite being brothers and getting their starts with the same franchise, Jamie and Jordie Benn traveled separate roads to the NHL. 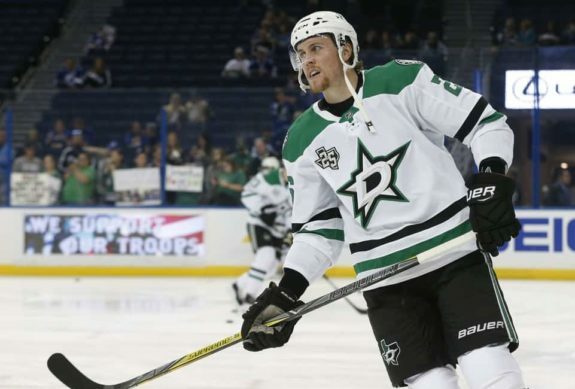 While the Dallas Stars drafted Jamie in the fifth round of the 2007 NHL Entry Draft, Jordie worked his way through the minor leagues. Playing for the Victoria Salmon Kings of the ECHL and the Allen Americans of the former CHL, Jordie took the minor league path when he wasn’t picked to play for a major junior team. Jamie originally intended to play college hockey for the University of Alaska – Fairbanks on a scholarship, but instead chose the Kelowna Rockets of the WHL. With only two seasons of major junior hockey under his belt, the Stars called up the younger of the two Benns to play his first full NHL season in 2009. That same season, Jordie signed with the Allen Americans and both brothers found themselves in Texas. 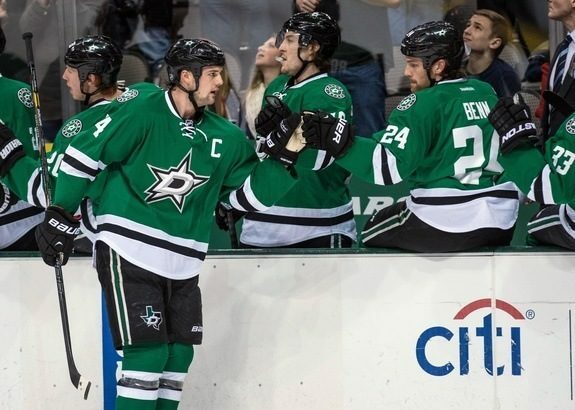 Today, Jamie serves as the Stars’ captain, a distinction he has held since the 2013-14 season. He represented Canada at the 2014 Sochi Olympics, scoring two goals in six games, including the only goal in a 1-0 shutout of the United States. He won a scoring title during the 2014-15 season, scoring four points in Dallas’ final game to finish with 87 points. On Jul. 15, 2016, he signed an eight-year contract extension that keeps him in Dallas through the 2024-25 season. Jordie spent parts of three seasons with Dallas’ AHL affiliate, the Texas Stars. He became a regular on the NHL club’s blue line during the 2013-14 season. He was traded to the Montreal Canadiens for fellow defenseman Greg Pateryn at the 2017 trade deadline. Raised by former NHL player and coach and current Vegas Golden Knights scout, Mike Foligno, Marcus and Nick were born and raised in Buffalo, New York. Born four years apart, the Foligno brothers never had the opportunity to play on the same team. With Canadian parents, both Nick and Marcus have duel citizenship. Elder brother Nick plays for the United States while Marcus represents Canada. Nick was drafted by the Ottawa Senators in the first round of the 2006 Entry Draft. He was traded to the Columbus Blue Jackets on Jul. 1, 2012 in exchange for Marc Methot. Following the 2014-15 season, he was named captain and has remained in the role since. He has represented the United States three times, all at the World Championships. Most recently, he competed at the 2016 championships, scoring five points in 10 games. Younger brother Marcus was taken by the Buffalo Sabres in the fourth round of the 2009 Draft. He made his NHL debut on Dec. 11, 2011 and scored his first goal on Mar. 10, 2012. On Jun. 30, 2017, he was part of a multi-player trade that sent him to the Minnesota Wild. An RFA at the time, he signed a four-year contract extension with the Wild. Marcus’ only international experience occurred when he won a silver medal with Canada at the 2011 World Junior Championship. In seven games, he posted four points. The Foligno family supports many charitable causes after losing their mother to cancer in 2009. Currently, both brothers and their sisters, Cara and Lisa, manage the Janis Foligno Foundation. The foundation is partnered with nine charities, including Meals on Wheels and the Northern Ontario Families of Children with Cancer. Before coming to North America, both Mikael and Markus Granlund played for HIFK Helsinki in Finland’s SM-liiga. Older brother Mikael was drafted ninth overall in the 2010 Draft by the Wild. Markus was selected by the Calgary Flames in the second round one year later. Mikael made his NHL debut on Jan. 19, 2013, opening night of the lockout-shortened season. He also scored his first career goal that night. 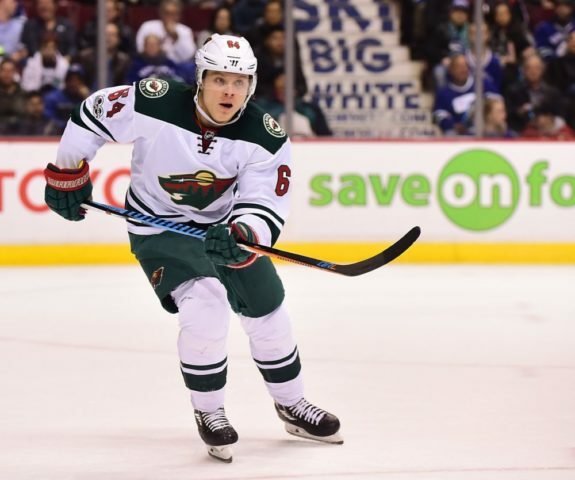 He has developed into one of the Wild’s best players and signed a three-year contract extension on Aug. 1, 2017. Markus made his NHL debut with the Flames on Feb. 27, 2014 and scored his first goal on Mar. 5 of the same year. On Feb. 22, 2016, he was dealt to the Vancouver Canucks in exchange for Hunter Shinkaruk. Both brothers have represented Finland in multiple international competitions. Mikael is a five time participant in the World Junior Championships, has played in four World Championships, one World Cup, and one Olympic tournament. In those appearances, he has won five medals: one gold, one silver, and three bronzes. Markus has represented Finland on five different occasions and was a teammate of Mikael at two different World Junior Championships. Natives of Massachusetts, both brothers played college hockey at Boston College. Jimmy helped the Eagles win the 2010 NCAA Championship while Kevin was named MVP of the 2014 Beanpot, an annual tournament between the college hockey teams in Boston. Kevin was also a finalist for the 2014 Hobey Baker Award as the nation’s top player. He lost to line mate Johnny Gaudreau. Older brother Jimmy was drafted by the Toronto Maple Leafs in the second round of the 2008 Draft. Before reaching the NHL, he was dealt to the Chicago Blackhawks and made his debut with them on Dec. 30, 2011. He was again traded, this time to the Florida Panthers, on Nov. 14, 2013. With the Panthers, Hayes set career highs during the 2014-15 season with 19 goals and 35 points. The following offseason, as an RFA, he was traded to his hometown Boston Bruins in a deal including Reilly Smith. He struggled in his two seasons with the Bruins and was bought out by the team on Jun. 30, 2017. In October, he was signed to a one-year deal by the New Jersey Devils and currently plays for the Pittsburgh Penguins’ AHL affiliate, the Wilkes-Barre/Scranton Penguins. Before playing at Boston College, younger brother Kevin was drafted 24th overall by the Blackhawks but never signed with them. After his collegiate career, he signed as a free agent with the New York Rangers on Aug. 20, 2014 and has remained with them since. Both brothers have represented the United States on the international stage and were teammates at the 2014 World Championship. Additionally, Kevin participated in the 2017 World Championship and Jimmy played in two World Junior Championships, in 2007 and 2009. They are second cousins with former NHL players, Tom Fitzgerald and Keith Tkachuk. Fitzgerald is also the current assistant general manager with the Devils. The Jones brothers, Caleb and Seth, were born into an athletic family. Their dad is long-time NBA player Popeye Jones who had over 3,700 points and 3,900 rebounds in his career and is currently an assistant coach with the Indiana Pacers. However, his sons didn’t follow in his footsteps and instead found their love of sports on the ice. Both brothers were born in Arlington, Texas as their father was playing for the Dallas Mavericks at the time. However, they grew up in Denver after Popeye was traded to the Denver Nuggets. It was in Colorado that Seth, the middle child, and Caleb, the youngest, learned to played hockey. Oldest brother Justin got the family into hockey when he asked for inline skates to play hockey with friends and that quickly turned into asking for ice skates. When the brothers wanted to play ice hockey, Popeye reached out to Colorado Avalanche legend Joe Sakic who connected the family with coaches and the rest is history. Seth played junior hockey for the Everett Silvertips and Portland Winterhawks of the WHL and the Nashville Predators drafted him fourth overall in 2013. He made his NHL debut that fall and was traded to the Blue Jackets in Jan. 2016 for Ryan Johansen. That June, Seth signed a six-year, $34.2 million contract. Still only 24, he played his best season in 2017-18 when he finished fourth in Norris Trophy voting. He has represented the United States at the 2011 and 2012 U18 World Championship, the 2013 World Juniors and at the 2015 World Championship. He was also a member of Team North America at the 2016 World Cup of Hockey. Youngest brother Caleb is also a defenseman but has been under the radar relative to Seth. The Edmonton Oilers drafted Caleb in the fourth round of the 2015 Entry Draft out of the U.S. National Team Development Program. Afterwards, he played two seasons with the Winterhawks and one in the AHL. He made his NHL debut this season and has appeared in seven games, scoring a goal and an assist. He has played for the United States at the 2015 U18 tournament and the 2017 World Juniors, winning gold at both. Swedish brothers Adrian and Mario Kempe have only recently made their NHL, each taking the ice for the first time in 2017. Older brother Mario took a non-direct path to the league, playing his junior hockey with MODO Hockey in Sweden. He represented Sweden at the 2006 U-18 World Championships and was taken 31st overall in that year’s CHL Import Draft by the St. John’s Fog Devils of the QMJHL. After his first year in North America, he was selected by the Philadelphia Flyers in the fifth round of the 2007 Entry Draft but didn’t sign. Instead, he returned to Sweden and played six seasons in the country’s top league, the SHL. After the 2013-14 season, he signed with Vityaz Podolsk of the KHL and played three seasons for them. In May 2017, he signed a one-year contract with the Arizona Coyotes and made his debut on Oct. 10. He is currently playing for Arizona’s AHL affiliate, the Tucson Roadrunners. Since his draft year, Mario played in one more international tournament, the 2008 World Junior Championships, helping Sweden win a silver medal. Younger brother Adrian is eight years younger than Mario so they haven’t had the opportunity to play on the same team. Adrian followed in Mario’s footsteps and played for MODO Hockey. He had a solid draft year playing against men in the SHL and was drafted by the Los Angeles Kings in the first round of the 2014 Entry Draft. He returned to Sweden for the 2014-15 season and made his NHL debut on Feb. 16, 2017. Adrian has established himself as a regular on the Kings roster for the 2017-18 roster and eclipsed the 15 goal mark for the first time. Adrian has represented Sweden on five occasions, all at the junior level, and helped them win gold at the 2013 U-17 Hockey Challenge. A close-knit family, the McGinns have been involved in hockey since each were two years old. It was at that age when they began skating. Skating evolved into their parents building a backyard rink every winter and the rest was history. Off ice, hockey still runs deep as the three sons and their father, Bob, are owners of the Roanoke Rail Yard Dawgs of the Southern Professional Hockey League. The eldest of three brothers, Jamie, played his junior hockey with the Ottawa 67’s of the OHL. He was drafted in the second round of the 2006 Entry Draft by the San Jose Sharks. After playing two more seasons in the OHL, he made his NHL debut with the Sharks on Oct. 28, 2008. Jamie has been been traded four times in his career, moving from the Sharks to the Colorado Avalanche, to the Sabres, to the Anaheim Ducks, and to the Panthers, where he currently plays. During the 2015-16 season, Jamie appeared in 84 games, 63 with the Sabres and 19 with Anaheim following a trade. Younger brother Brock also played junior hockey in the OHL, spending four seasons with the Guelph Storm. He was drafted by the Carolina Hurricanes in the second round of the 2012 Draft and made his debut for the Hurricanes on Oct. 16, 2015. In his first game, he scored on his first shift, 55 seconds into the game. 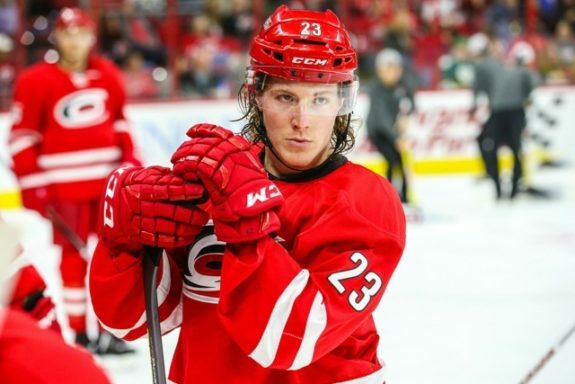 Youngest brother Brock McGinn with the Carolina Hurricanes. Jamie and Brock have a third brother, Tye, who is currently playing for the AHL’s Tucson Roadrunners in the Coyotes’ system. The middle brother was drafted by the Flyers in the fourth round of the 2010 Draft. Since being a Flyer, Tye has also played for the Sharks, Coyotes, and the Tampa Bay Lightning. Brothers Brett and Nick Ritchie have athleticism pumping through their veins. Parents Paul and Tammy are gifted athletes. Paul played hockey at the OHL level and later coached peewee hockey and Tammy played volleyball, softball, and basketball. The love of sports was passed down to their sons and they were encouraged to participate in as many as they wanted. This included lacrosse, a sport that both brothers excelled in while playing for their local program, the Orangeville Northmen. On the ice, older brother Brett began his junior career with the OHL’s Sarnia Sting. With the Sting, he was chosen to play in the 2011 CHL Top Prospects Game but had to skip the event due to mononucleosis. In 2012, he was traded to the Niagara Icedogs, also of the OHL. Brett was drafted by the Stars in the second round of the 2011 Entry Draft and made his NHL debut on Dec. 31, 2014. Brett has represented Canada on four different occasions, all the junior level, winning two gold medals. Most recently, he played in the 2013 World Junior Championships. Nick followed in his older brother’s footsteps by going the OHL route, playing for the Peterborough Petes and later, the Sault Ste. Marie Greyhounds. Born two years apart, Brett and Nick did not have the opportunity to play at the same level growing up. Nick was drafted 10th overall by the Ducks in 2014 and debuted for them on Nov. 16, 2015. During the 2017 Playoffs, he played in 15 games for the Ducks and was ejected from game six of the Western Conference Final for boarding Nashville Predator Viktor Arvidsson. Like Brett, Nick has played for Canada four times, all at the junior level. He has won a medal each time, including three golds. Both Brayden, a center, and Luke, a defenseman, are former first round picks and both were taken fifth overall. Older brother Luke was drafted by the Maple Leafs in 2008 while Brayden was taken in 2009 by the Kings. Born in Saskatchewan, both played their junior hockey in the WHL, Luke with the Kelowna Rockets and Brayden with the Brandon Wheat Kings. Luke made his NHL debut on Oct. 29, 2008 after Toronto decided to not send him back to Kelowna. He was traded to the Flyers on Jun. 23, 2012 for James van Riemsdyk, which gave the Schenns an opportunity to play together. Luke was traded once more on Jan. 6, 2016, this time to the Kings. After his deal expired that offseason, he signed a two-year deal with the Arizona Coyotes. During the 2018 offseason, he signed a one-year deal with the Ducks and has gone between the NHL and AHL clubs. Like Luke, Brayden also made his NHL debut in his draft year, playing on Nov. 20, 2009, but played the majority of the season with the Wheat Kings. He was traded to the Flyers along with Wayne Simmonds on Jun. 23, 2011 for Mike Richards and Jeff Carter. 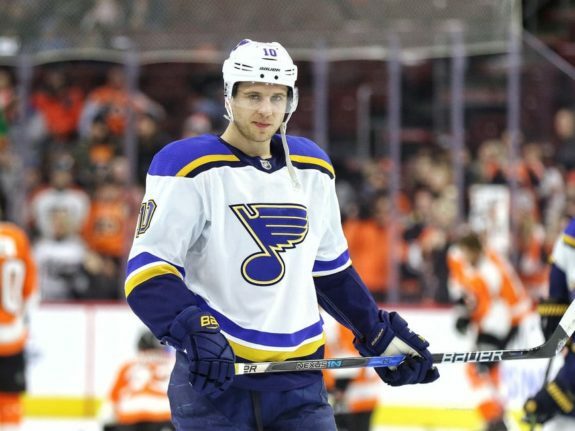 He signed a four-year, $20.5 million contract extension in 2016 and was traded to the St. Louis Blues on Jun. 23, 2017. He had the best season of his career with the Blues, scoring 28 goals and 70 points. Both brothers have represented Canada internationally but have yet to play on the same team. Luke has participated in nine tournaments, most recently at the 2013 World Championships. He has helped Canada win three golds and a silver. Brayden has played for Canada on seven occasions, including the 2017 World Championships. He has had more success than Luke, winning three golds, and three silvers. In his time with the Maple Leafs, Luke donated $10,000 to start “Luke’s Troops,” giving Canadian servicemen and women the opportunity to attend a game as his guests. Since 2006, the brothers have organized the Luke and Brayden Schenn Celebrity Golf Classic. The goal of the event is to raise money for the Royal University Hospital Foundation. Since the inaugural event, they have raised $1.3 million for the foundation. Madison, Wisconsin natives, Jordan and Nick Schmaltz have a lot in common. They both played for the Green Bay Gamblers of the USHL, both attended the University of North Dakota, both are former first round draft picks, and both play in the Central Division. There are also differences, including that Jordan is a defenseman while Nick plays center. Eldest brother Jordan attended UND because that’s where his father and two uncles attended and played football. While attending UND, he majored in communications and social science. After three seasons, he signed his entry-level contract with the Blues, the team that took him 25th overall in 2012. He made his NHL debut on Mar. 5, 2017 and is currently with the Blues’ AHL affiliate, the San Antonio Rampage. Nick, three years younger than Jordan, was drafted 20th overall by the Blackhawks in the 2014 Draft. Already committed to UND, he played two seasons for the Fighting Hawks. During the 2015-16 season, he skated on a line with future NHLers Drake Caggiula and Brock Boeser. Nick also scored the game-winning goal in the 2016 NCAA Championship against the University of Denver. Following that season, he signed his entry-level contract with the Blackhawks and made his debut on Oct. 12, 2016. In Nov. 2018, he was traded to the Coyotes where he is thriving in an increased role. Both brothers have represented the United States internationally. Jordan won gold at the 2010 U-17 Hockey Challenge in his only tournament. Nick has played in four tournaments, winning silver at the 2013 Ivan Hlinka Tournament and bronze at the 2016 World Junior Championships. Jordan and Nick have two other siblings. Sister Kylie is a volleyball player at the University of Kentucky and Jake is a hockey player with Wisconsin’s U-16 team. 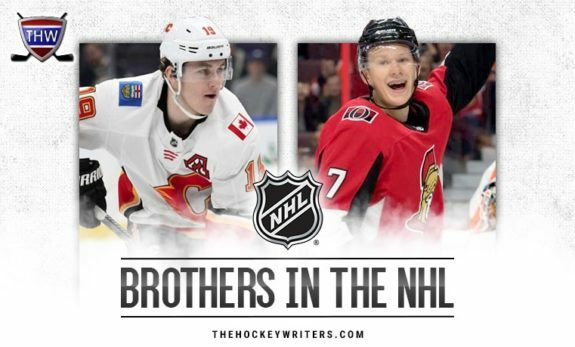 Born three years apart, defenseman Brendan and forward Reilly Smith lacked opportunities to play for the same junior teams, but both followed a similar path to the NHL. Each played college hockey and were Hobey Baker Award finalists as the nation’s top player. Older brother Brendan played for the University of Wisconsin and was a finalist in 2010, while Reilly played three seasons for Miami (OH) University and was a finalist in 2012. The Detroit Red Wings drafted Brendan in the second round of the 2007 Entry Draft and he made his debut on Nov. 11, 2011. On Feb. 28, 2017, and with an expiring contract, he was dealt to the New York Rangers at the trade deadline. After the season, he re-signed with the Rangers for four years. On Feb. 8, 2018, he was placed on waivers and was sent to their AHL affiliate, the Hartford Wolf Pack. 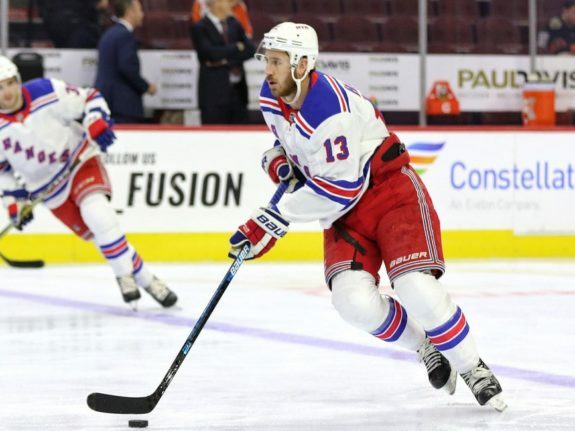 He has since been recalled and plays on the Rangers’ third pair. Reilly was drafted by the Stars in the third round of the 2009 Entry Draft. Following the trade that sent Reilly and Loui Eriksson to the Bruins in exchange for Tyler Seguin and Rich Peverley, Reilly and Brendan faced each other in the playoffs for the first time. In that first round series, Reilly’s Bruins emerged victorious. On Jul. 1, 2015, he was traded for a second time, moving from Boston to the Panthers along with Marc Savard’s contract in exchange for Jimmy Hayes. With the Panthers, Reilly set a career high in goals with 25. On Jun. 21, 2017 at the Expansion Draft, Reilly was sent to the Vegas Golden Knights to clear cap space for the Panthers. Although there are numerous examples of brothers in the NHL, having four in the league at the same time is a rarity. Yet, that is exactly what the Staal family accomplished when youngest brother, Jared, made his debut on Apr. 25, 2013. He joined brothers Eric and Jordan as a member of the Hurricanes and faced the Rangers. Had older brother Marc, a Ranger, been healthy at the time, all four would have played in that game. Oldest brother Eric was drafted second overall by the Hurricanes in the 2003 Draft. He made his debut that season and helped guide the Hurricanes to a Stanley Cup in 2006. He was named captain in 2010 and held that title until 2016 when he was traded at the deadline to the Rangers. That offseason, he signed a three-year deal with the Wild. Eric is one of just 27 players to join the exclusive Triple Gold Club, the name given to players or coaches who have won a Stanley Cup and captured gold at the Olympics and World Championships. He won gold with Team Canada at the 2010 Vancouver Olympics and the 2007 World Championships. He has represented Canada on three other occasions, twice more at the World Championships and once at the World Junior Championships. Marc is the only defenseman of the four brothers and was drafted 12th overall by the Rangers in the 2005 Draft. He made his debut on Oct. 4, 2007 and has remained a Ranger his entire career. 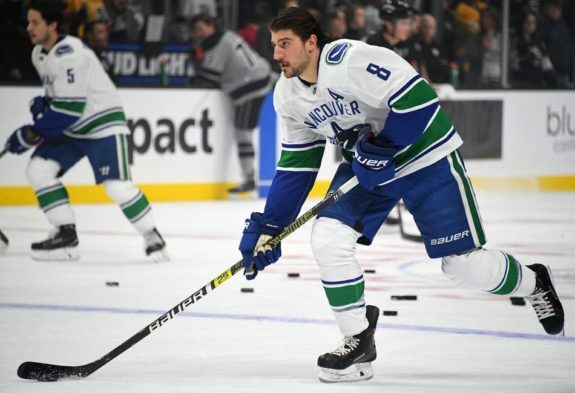 When healthy, Marc has been a shutdown defender with offensive upside, but has had a history of career-threatening injuries, including multiple concussions and a retinal tear when a puck struck his eye. He has represented Canada five times, winning gold on four occasions, including two World Junior Championships. At the 2006 Draft, the Penguins selected Jordan with the second overall pick. Like his brother, Eric, Jordan joined the NHL club right away and had an immediate impact. He finished third in Calder Trophy voting that season and helped Pittsburgh win the 2009 Stanley Cup. On Jun. 22, 2012, he was traded to the Hurricanes for Brandon Sutter, Brian Dumoulin, and a first round pick. On Jul.1, 2012, he signed a 10-year extension with the Hurricanes. He has played for Canada four times and won gold at the 2006 Ivan Hlinka Tournament and at the 2007 World Championships. Youngest brother Jared has not had the same success in the NHL as his brothers. He was drafted in the second round of the 2008 Draft by the then-Phoenix Coyotes. On May 13, 2010, the Hurricanes acquired his rights and signed him to an entry-level contract. He spent five seasons in their organization before he was released in 2015. Most recently, he spent the 2016-17 season playing for the Edinburgh Capitals of the Elite Ice Hockey League in the United Kingdom. 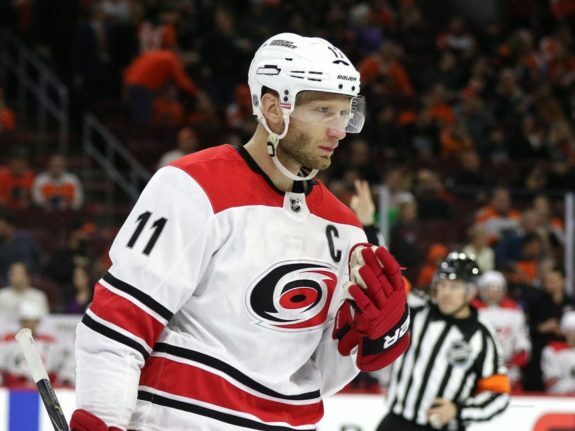 As a family, the four brothers established the Staal Family Foundation, which provides help to children and families suffering from cancer. One event the foundation sponsors, the Staal Foundation Open golf tournament, raised $271,000 in 2017. That money was distributed to Camp Quality Northwestern Ontario, the Northern Cancer Fund, and the Smilezone Foundation. Older brother Michael is currently a defenseman with the Flames. A Manitoba native, he played junior hockey for the Calgary Hitmen of the WHL. He was drafted by the then-Phoenix Coyotes in the third round of the 2008 Draft. 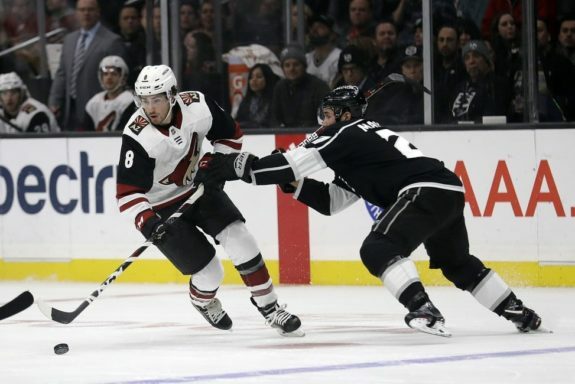 He made his debut for the Coyotes on Feb. 18. 2012. He was traded at the 2017 Trade Deadline to the Flames and re-signed with them, agreeing to a three-year deal. Mark is a right wing who also played in the WHL but with the Brandon Wheat Kings. He and Michael face each other in the 2010 Memorial Cup semi-finals with Mark’s Wheat Kings emerging victorious. He was drafted by the Senators in the sixth round of the 2010 and made his debut with them in the playoffs on Apr. 21, 2012 against the Rangers. This came immediately after his WHL season had finished and before he had even played in the AHL. His regular season debut came nearly a year later on Mar. 6, 2013. He finished runner-up in 2015 Calder Trophy voting for rookie of the year and was in the top 10 for Selke Trophy voting in 2017. Mark has played for Team Canada twice, once at the 2012 World Junior Championships where they won bronze, and at the 2016 World Championships, winning gold. Currently, there are two Stromes in the NHL. Ryan is with the Rangers and Dylan is a member of the Blackhawks. There is a third brother, Matthew, who was selected in the fourth round of the 2017 Draft by the Flyers. He is currently playing for the Hamilton Bulldogs of the OHL. Ryan is the oldest brother and got the ball rolling when he was taken fifth overall by the New York Islanders in 2011. Prior to being drafted, he played for the OHL’s Barrie Colts and Niagara Icedogs. He made his NHL debut on Dec. 14, 2013. In June 2017, he was traded to the Oilers for Jordan Eberle. In Nov. 2018, he was again traded, this time to the Rangers in exchange for Ryan Spooner. He has played in three junior level tournaments, including two World Junior Championships for Canada. His teams have won a silver and a bronze. Dylan is the middle brother and has a plethora of potential. 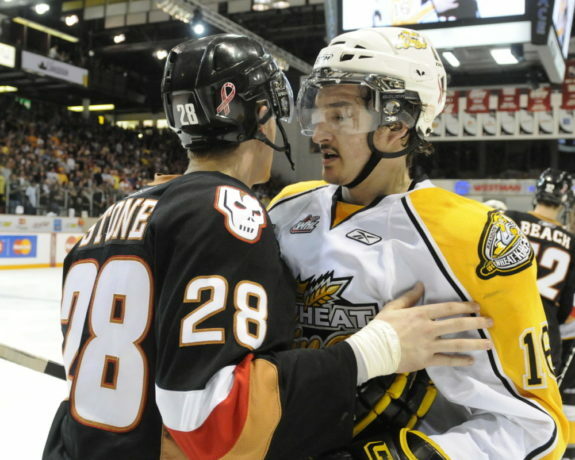 He is four years younger than Ryan so the Strome name was well-known when Dylan joined the OHL. He played all four years of junior hockey with the Erie Otters which included Connor McDavid and Connor Brown. He won the 2015 OHL scoring title and established a new scoring record for the Otters. In the 2017 Memorial Cup Tournament, he set a tournament record with seven points in one game against the Saint John Sea Dogs. Dylan was drafted third overall by the Coyotes in the 2015 Entry Draft. He made his NHL debut on Oct. 18, 2016 but was sent back down to Erie for the duration of the season. Like older brother Ryan, Dylan too was traded in Nov. 2018, going from the Coyotes to the Blackhawks. He has also competed for Canada on the international stage, twice participating in the World Junior Championships, and once each at the U-17 Hockey Challenge and the Ivan Hlinka Tournament. His teams have won one gold and one silver medal. 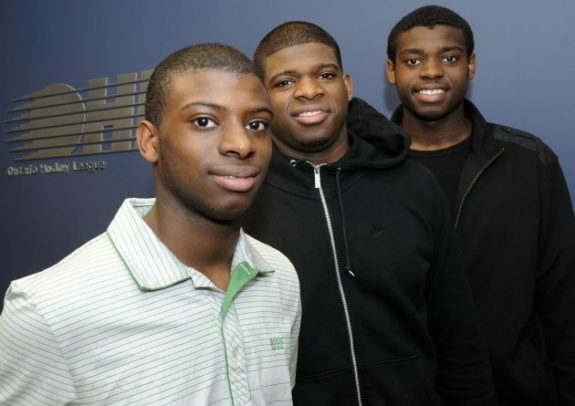 The Subbans rise to the NHL is quite the improbable one. Parents Karl and Maria were born on the Caribbean islands of Jamaica and Montserrat, respectively. Both immigrated to Canada when in 1970, met in Toronto and married. Jordan, P.K. and Malcolm Subban. Older brother P.K. played his junior hockey with the Belleville Bulls of the OHL where he scored 56 points in 68 games as a defenseman during the 2006-07 season. He was drafted following that season in the second round by the Canadiens. He made his NHL debut on Feb. 12, 2010 and appeared in 14 playoff games for the Canadiens that year, scoring eight points. He won the Norris Trophy for the league’s best defenseman following the lockout-shortened 2012-13 season when he posted 38 points in 42 games. In 2014, he became the highest paid defenseman in the league when he signed an eight-year, $72 million deal, avoiding arbitration. On Jun. 29, 2016, he was traded in a blockbuster deal to the Predators for Shea Weber. In his first season, he helped the Predators reach the Stanley Cup Final, losing to the Penguins in six games. In addition to his Norris, P.K. has been named an all-star twice and has been a Norris finalist one other time. He has represented Canada five times, three at the junior level and two at the senior level. When he has participated, Canada has won three gold medals, including at the 2014 Sochi Olympics. Off-ice, P.K. has been involved in numerous charities. After he signed his eight-year deal with the Canadiens, he committed to raising $10 million for the Montreal Children’s Hospital by 2022. For his efforts, he was award the Meritorious Service Cross by the Canadian government. Even after his trade to Nashville, he has continued this commitment and visits the hospital each time the Predators play in Montreal. In Nashville, P.K. established his charity, “P.K.’s Blue Line Buddies” with the goal of establishing a better relationship between law enforcement and inner-city children. For each home game, the organization purchases tickets for a law enforcement officer, a child, and their guests. He also treats them to a buffet at the premium restaurant at Bridgestone Arena and gets to meet P.K. and other Predators before and after the game. Younger brother, Malcolm, is four years younger than P.K. and also played for the Bulls, but as a goaltender. He was drafted by the Bruins 24th overall in the 2012 draft and appeared in his first NHL game on Feb. 20, 2015. With the Bruins, he played in just two games. On Oct. 3, 2017, he was claimed off waivers by the Golden Knights and won his first game on Oct. 15, facing the Bruins. 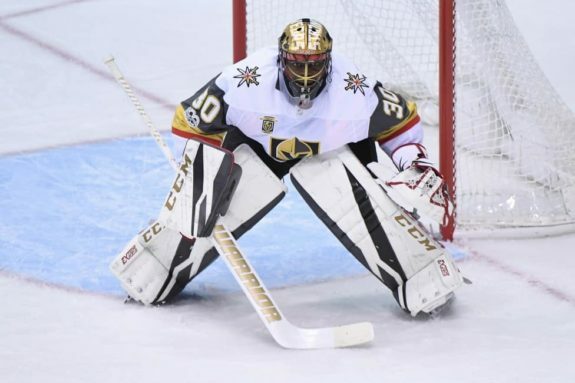 With an injury to starter Marc-Andre Fleury, Malcolm became the Golden Knights’ starting goalie. On Dec. 8 he faced P.K. for the first time, making 41 saves en route to a 4-2 Vegas win. Malcolm has played for Canada once, at the 2013 World Junior Championships, where they finished fourth. P.K. and Malcolm have a third brother, Jordan, who is a defenseman and is two years younger than Malcolm. Like his brothers, Jordan also played for the Bulls. He was drafted by the Canucks in the fourth round of the 2013 Entry Draft. With the Canucks, he was called up one time but did not see any game action. During the 2018 offseason, Jordan signed a one-year contract with the Maple Leafs and currently plays for their AHL affiliate, the Toronto Marlies. Although the Svechnikov brothers are Russian, both played junior hockey in the CHL before turning pro. Older brother Evgeny played for the Cape Breton Screaming Eagles of the QMJHL while Andrei played for the OHL’s Barrie Colts. The Red Wings drafted Evgeny 19th overall in 2015 and he played a plus-one year with Cape Breton. After losing junior hockey eligibility, he has mostly played in the AHL with 27 goals and 74 points in 131 games. He was expected to be in the NHL this season, however a torn ACL in the preseason ended his season. Evgeny has represented Russia twice at the U18 World Championships and once at World Juniors, winning a silver medal in 2016. Of the two brothers, Andrei had the better pedigree entering the 2018 Entry Draft. He was predicted to go anywhere between second and fifth and ended up being drafted by the Hurricanes second overall. Just 18 years old, he has been in the NHL since the season began and has 11 goals and 19 points in 38 games. He was a bronze medal with Russia’s U18 World Championship team in 2017. Older brother Chris is currently a defenseman with the Canucks but took the road less traveled to get there. Growing up, he was cut from seven midget teams due to his small stature and resorted to playing high school ice hockey as well as roller hockey in the summers. After graduating, he played one season of college hockey for the Rochester Institute of Technology in New York. On May 31, 2010, he signed as an undrafted free agent with the Canucks and made his debut on Jan. 18, 2011. By making his debut, he became the first RIT alumnus to play in the NHL. Chris represented Canada at the 2016 World Championships, winning gold. Younger brother Brandon plays left wing for the Winnipeg Jets and also went the college hockey route. He played four seasons with Providence College and scored the game-winning goal in the 2015 NCAA Championship game. On March 30, 2016, he signed with the Jets and made his debut with them on April 5 of that year. The Tkachuk family is more like the Howes than the Benns, Folignos or any other set of siblings on this list. That’s because Brady and Matthew’s dad is Keith, a member of the United States Hockey Hall of Fame and with 538 career goals to his name. He also won an Olympic silver in 2002, a gold medal at the 1996 World Cup and a World Junior bronze, so it shouldn’t be surprising that both of his sons were drafted and are thriving in the NHL. Matthew, the oldest Tkachuk child, was drafted sixth overall by the Flames in the 2016 Entry Draft. Prior to being drafted, he played for the OHL’s London Knights and scored 30 goals and 107 points in 57 games his draft year. He followed up the regular season with 20 goals and 40 points in 18 playoff games as he helped the Knights win a Memorial Cup. He joined the Flames in 2016-17, stayed in the NHL all season and finished seventh in Calder Trophy voting. He’s currently experiencing his best season in the NHL with better than a point-per-game scoring rate. Brady went the college hockey route prior to turning pro, playing one season at Boston University and finished with eight goals and 31 points in 40 games. At season’s end he was named to Hockey East’s All-Rookie Team. The Senators drafted Brady fourth overall at the 2018 Entry Draft, continuing a run of Tkachuks chosen in the first round as he followed Matthew (sixth overall) and Keith (16th overall). Brady has been with the Senators the entire season and has 10 goals and 20 points in 29 games and will be a potential Calder Trophy finalist. Fun fact: when Brady was drafted in the first round, he and Keith became the only father/son duo to be drafted in the first round out of college. Both brothers were born in Scottsdale, Arizona as Keith was playing for the Phoenix Coyotes at the time. However, they grew up in the St. Louis area after Keith was dealt to the Blues in 2001. Although Brady and Matthew have dual American/Canadian citizenship, a result of their mom being Canadian, both brothers represent the United States internationally. Matthew won gold at the 2015 U18 World Championship and a silver at the 2016 World Juniors while Brady captained the Americans to gold at the 2017 U18 tournament and was a member of the silver-winning team at the 2018 World Juniors. 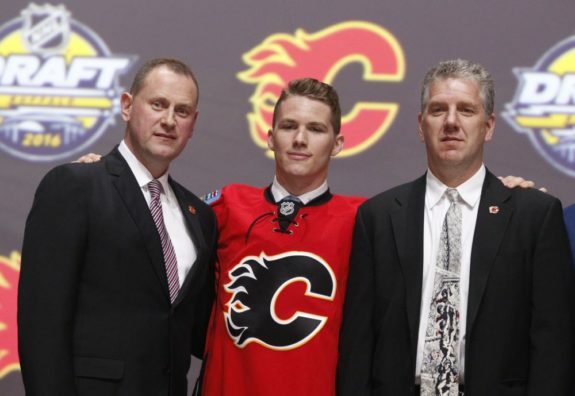 What’s interesting about the Tkachuk brothers is that they play a style similar to each other, and to their father. Both are unafraid to fight or take the abuse that comes with screening a goaltender. Both are also known as agitators and pests, something Keith recognizes in both sons. However, both brothers are also leaders, just like their dad who captained the Jets and the Coyotes and was an alternate captain with the Blues. In his third season, Matthew is an alternate captain of the Flames and appears to be the heir apparent to Mark Giordano to wear the “C” in the future. Meanwhile, with the turnover that is occurring in Ottawa, Brady is likely to take on a leadership role in the coming seasons as he gains experience. Elder brother James van Riemsdyk was selected second overall in the 2007 Entry Draft by the Flyers. Before signing his first contract, he committed to play college hockey at the University of New Hampshire, a path followed by his two brothers. After two seasons at UNH, James joined the Flyers and made the NHL roster out of training camp in 2009. As a rookie, he participated in the Stanley Cup Final which the Flyers lost to the Blackhawks in six games. On Jun. 23, 2012, he was traded to the Maple Leafs for Luke Schenn. A physical left winger, James has four 25 goal seasons to his name. As a free agent in July 2018, he signed a seven-year, $35 million deal to re-join the Flyers. Internationally, he has represented the United States eight times, including at the 2014 Sochi Olympics. Younger brother Trevor may have followed in James’ footsteps by attending UNH, but that is where the similarities stop. Trevor is a defenseman and went undrafted. After three years of college hockey, he signed with the Blackhawks as a free agent on Mar. 24, 2014. He made his debut on Oct. 9, 2014 and won a Stanley Cup the next spring as Chicago defeated the Lightning. At the 2017 Expansion Draft, he was left exposed and was taken by the Golden Knights. The next day, Jun. 22, he was dealt to the Hurricanes. Trevor has represented the United States on one occasion, participating in the 2017 World Championships. James and Trevor have a third brother, Brendan, who is the youngest and currently attending UNH. A center, Brendan is currently in his second season.